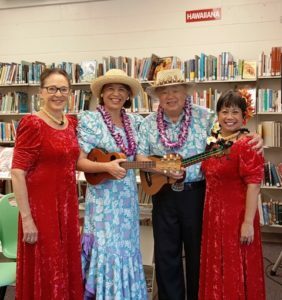 The Hawaiian Serenaders presented a show with hula dancers at Makawao Library in April 2019. The Hawaiian Serenaders – Richard Tom and Mele Fong – presented a Nostalgic Hawaiian Music show with hula dancers on Saturday, April 13 at 1 p.m. at Makawao Public Library in upcountry Maui. The husband-wife duo played ‘ukulele and u-bass and sang a variety of Hawaiian and hapa haole songs reminiscent of old Hawai’i. This musical program was part of the library’s 50th anniversary celebration and the second time in two years the Serenaders have been invited to perform at the library. 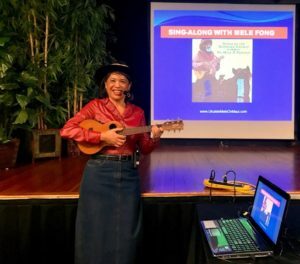 The program included songs about Hawaiian cowboys in keeping with the Makawao Library’s upcountry lifestyle, four songs with two hula dancers (Kaleo and Nalani), and two songs with chant and melodies in the same arrangement. “I liked the variety,” commented the audience. The Serenaders are artists with the University of Hawai’i at Manoa’s Statewide Cultural Extension Program, and have represented the state of Hawai’i in concert at the John F. Kennedy Center for the Performing Arts in Washington, D.C. Rich and Mele are both Hawai’i born and raised. Visit The Hawaiian Serenaders webpage to hear song samples, view photos, and read reviews. You can also learn to play the ‘ukulele the unique Ukulele Mele Way from wherever you live! Keep up-to-date – receive Mele’s monthly e-newsletter UKE News You Can Use. SIGN-UP TODAY! 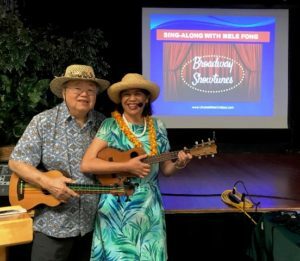 We led the playing of 12 ukulele arrangements with vocals to Broadway Show Tunes during March’s Sing-Along with Mele Fong monthly series on Maui. Thirty-three people signed up for my new monthly Sing-Along with Mele Fong Series – Broadway Show Tunes on Thursday, March 14, 2019 at Kaunoa Senior Center for adults 55 and better on Maui. We sang songs that were popular from vaudeville days to the 1960s. During the “Hawaiian history moment of the month,” I talked about the birthdays of two Hawaiian alii (royalty) that are celebrated in March. Queen Ka’ahumanu, the favorite wife of King Kamehameha, was born on March 17, 1768, and celebrated with a public program by the Ahahui Ka’ahumanu at Queen Ka’ahumanu Center on March 15. Prince Jonah Kuhio, Hawaii’s longest serving territorial representative to congress, was born on March 26, 1871, and celebrated with a state holiday. Learn more about these two Hawaiian leaders. We continued the “Sing-Along with Mitch Miller” format of projecting the song lyrics and ‘ukulele chords on a screen at the front of the room for singers and ‘ukulele players to see. We also continued the routine of telling the story behind each song and playing each song twice to reinforce what we learned. Give My Regards to Broadway – Bossa Nova Strum. Getting to Know You – I Wanna Rest Strum. Oh What a Beautiful Morning – 2 Waltz Strums. I Whistle a Happy Tune – Hum Ding-Ah Strum. Summertime – I Wanna Rest Strum. I Could Have Danced All Night – Latin Strum. Sound of Music – Pick in 4 Strum. Singing In The Rain – Hum Ding-Ah Strum. My Blue Heaven – I Wanna Rest/4And Strums. Moon River – 2 Waltz Strums. Hawaii Aloha – Morse Code Strum. DOWNLOAD A SINGLE SONG PURCHASE to your digital device. Get the song sheets, video lesson, audio recording, and video story behind the song for only the song you select. LISTEN TO THE AUDIO RECORDINGS IN THE FREE ONLINE FAN CLUB. From the Pop Songs Category – DO-RE-MI, Getting to Know You, Give My Regards to Broadway, I Could Have Danced All Night, I Whistle a Happy Tune, My Blue Heaven, Oh What a Beautiful Morning, Singing in the Rain, and Sound of Music. See all categories of songs with over 100+ audio recordings that you can sing and play along with professional entertainers on voice, ‘ukulele, and ‘ukulele-bass. The next Sing-Along with Mele Fong Series – Hula Songs is Thursday, April 18. Visit my webpage about classes at Kaunoa and see photos from past classes for more information. Thirty-seven people signed up for the monthly Sing-Along with Mele Fong Series – Paniolo Songs on Thursday, February 21, at Kaunoa Senior Center for adults 55 and better on Maui. “I want one of your ‘ukulele books,” commented a first timer visiting from California by way of Italy after the program. “I remember seeing you perform at the Shops At Wailea the last time we were in town,” commented another first timer who was referring to our Ukulele Mixed Plate group lessons and entertainment show in 2015. “We’ll have to plan to be here long enough to take your ‘ukulele classes next year,” commented Bob and Carol from New York. Thirty-seven people signed up for my monthly Sing-Along with Mele Fong Series – Paniolo Songs on Thursday, February 21, 2019 at Kaunoa Senior Center for adults 55 and better on Maui. We sang Hawaiian cowboy, country and western songs. During February’s “Hawaiian history moment of the month,” I talked about the statue of Ikua Purdy roping a steer that was erected on the Big Island of Hawai’i in February 2003 to honor the Native Hawaiian who stunned the American west by winning the World Roping Championship in Wyoming in 1908. We continued the “Sing-Along with Mitch Miller” format of projecting the song lyrics and ‘ukulele chords on a screen at the front of the room for singers and ‘ukulele players to see. Our wireless headsets and wireless instrument inputs made it possible to move around without being attached to cables to the amplifier. We also continued the routine of telling the story behind each song and playing each song twice to reinforce what we learned. Paniolo Country – Hum Ding-Ah Strum. NEW I’m An Old Cowhand (From the Rio Grande) – Hum Ding-Ah Strum. Could I Have This Dance – 2 Waltz Strums. Hey Good Lookin’ – Hum Ding-Ah Strum. NEW Home on the Range – 2 Waltz Strums. Ring of Fire – Hum Ding-Ah Strum. King of the Road – I Wanna Rest Strum. NEW Red River Valley – Hum Ding-Ah Strum. Take Me Home Country Roads – Latin Strum. From the Hapa Haole Songs Category – Paniolo Country. From the Hawaiian Songs Category – Ulupalakua. From the Pop Songs Category – Could I Have This Dance, Hey Good Lookin’, Home On The Range, King of the Road, Ring of Fire, and Take Me Home Country Roads. The next Sing-Along with Mele Fong Series – Broadway Show Tunes is Thursday, March 14. Oahu Stories and Songs was the title of an Ukulele Mele On Maui class on Wednesday, January 30 from 10 a.m. – 12 noon at Kaunoa Senior Center for adults 55 and better. “We went to places I’ve never seen before,” commented a returning participant after the program. “The first time I saw Hawaii was as a sailor on a Navy ship entering Pearl Harbor, and when I saw the mountains I knew I wanted to live here someday,” commented another participant. Fourteen people signed up for the first of my new Oahu Island Stories and Songs class on Wednesday, January 30, 2019 at Kaunoa Senior Center for adults 55 and better on Maui. The class was the first of my new Island Stories and Songs Series this year scheduled for the 5th Wednesdays of the month. I chose Oahu to kickoff the series because that it is the island where I grew up. It was fun to add personal stories to places I have been to over the years. My idea worked – the audience clapped and expressed their appreciation for my new class. Iolani Palace, Kamehameha’s Statue, Lili’uokalani’s Statue, Washington Place, Kamaka Ukulele Store, Foster Gardens, Mt. Tantalus, Punchbowl National Memorial Cemetery of the Pacific, Pearl Harbor for the Arizona Memorial and U.S.S. Missouri, Bernice Pauahi Bishop Museum, Plantation Village, Dole Plantation, Waimea Valley, North Shore – Haleiwa, Polynesian Cultural Center, Byodo-In Temple, Nuuanu Pali Lookout, Queen Emma Summer Palace, Hanauma Bay State Park, Waikiki and Kapiolani Park including the Shell and Honolulu Zoo, and Honolulu City Lights (Christmas display in December). On The Beach At Waikiki – Hum Ding-Ah Strum. O Beautiful Ilima – I Wanna Rest Strum. Hukilau Song – Hum Ding-Ah Strums. Honolulu I’m Coming Back Again – I Wanna Rest Strum. DOWNLOAD A SINGLE SONG PURCHASE to your digital device. Buy the bundle and get four downloadable files: song sheets with chords and lyrics (no musical notes to read), video lesson on how to play the song, audio recording by professional musicians, and video story behind the song in keeping with Hawaiian oral history traditions whether the song is Hawaiian or not. SUBSCRIBE TO ONLINE LESSONS. Get the song sheets, video lesson, audio recording, and video story behind the song with unique strumming styles for 30 days at-a-time. Select the One Month Trial or the Recurring Monthly Package. Advanced Online Lessons aka Complete Monthly Online Lessons – Hawaii Aloha, Honolulu I’m Coming Back Again, On The Beach at Waikiki, and 47 other songs. See all levels available for beginners to advanced players. LISTEN TO THE RECORDINGS IN THE FREE ONLINE FAN CLUB. From the Hapa Haole Songs Category – Hukilau Song. See all categories of songs with over 100+ audio recordings by professional entertainers on voice, ukulele, and ukulele-bass. Stay tuned for the next Island Stories and Songs Series – Big Island of Hawai’i on Wednesday, May 26. Oahu Stories and Songs is the title of an Ukulele Mele On Maui class on Wednesday, January 30 from 10 a.m. – 12 noon at Kaunoa Senior Center for adults 55 and better. Oahu Stories and Songs is the title of my class on Wednesday, January 30 from 10 a.m. – 12 noon at Kaunoa Senior Center for adults 55 and better on Maui. This is the first in the new series this year of Island Stories and Songs scheduled for the 5th Wednesdays of the month. I thought it a good idea to offer a virtual tour of the four major Hawaiian Islands, especially for those who don’t travel that much anymore. I chose to start the series with Oahu the island where I grew up. Students will visit twenty-two places of interest while learning the cultural symbols, geography, Hawaiian historical places, scenic overlooks, and more about Oahu. Plus we will sing and play ‘ukulele to five songs about Oahu and learn the stories behind the songs in keeping with Hawaiian oral history traditions. Lunch is optional and a good time to sit around and talk story with like minded people who enjoy learning about the Hawaiian Islands, singing, and playing the ukulele. SIGN UP NOW by calling Kaunoa at 808-270-7308. See the 2019 schedule of Island Stories and Songs Series at Kaunoa. See the 2019 schedule of all Ukulele Mele classes at Kaunoa. See the Senior Classes webpage for photos and more. Not on Maui? Learn to play the Ukulele Mele Way – subscribe to online lessons or download single song lessons – from wherever you live! Sixteen people signed up for the monthly Sing-Along with Mele Fong Series – Maui Nui Songs on Thursday, January 10, 2019 at Kaunoa Senior Center for adults 55 and better on Maui. “You made my month,” commented a returning participant after the program. Sixteen people signed up for my monthly Sing-Along with Mele Fong Series – Maui Nui Songs on Thursday, January 10, 2019 at Kaunoa Senior Center for adults 55 and better on Maui. We sang Hawaiian and hapa haole songs about our home island of Maui, Molokai, and Lanai which comprise “Maui Nui” aka Maui County for the first program for the New Year. During January’s “Hawaiian history moment of the month,” I talked about the greeting Hau’oli Makahiki Hou to say Happy New Year. In ancient Hawaii, the Makahiki Season was a celebration of abundance of land and sea and the accomplishments of the Hawaiian People. It was the time for healing, new growth, a time of peace and spiritual cleansing of the Hawaiian mind, sound and heart, in celebration of life. The season lasted approximately four months between November and February. New this month, we sang the first song without my husband Rich’s accompaniment on u-bass as he was having technical difficulties plugging into the Center’s PA system (the person who usually sets up the system was unavailable). What a difference when Rich joined us on the second song by playing the lower bass notes to fill in the higher pitched ukulele to create a fuller sound! New this month, I lowered my expectations and approach to teaching people how to sing songs in the Hawaiian language. I did not ask everyone to repeat after me for each line in the Hawaiian language – I pronounced the Hawaiian words once, explained the meaning, and asked people to do what they could – because this is music appreciation not Hawaiian language class. I believe it’s good for people to hear songs in the Hawaiian language and to know what the songs are about because we live in Hawaii, but they do not need to become proficient in singing Hawaiian lyrics in order to appreciate the songs and the stories being told through music. After the program when I asked participants for feedback, they appreciated this change. Medley: Maui Boy/Maui Girl – Hum Ding-Ah Strum. Medley: Sea Breeze/Puamana – I Wanna Rest Strum. Maui Waltz – 2 Waltz Strums. 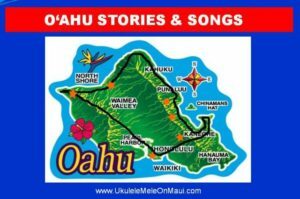 Medley: Maui/Molokai/Lani songs – Hum Ding-Ah/I Wanna Rest Strums. Hasegawa General Store – I Wanna Rest/4 And Strums. Kula Morning – Latin Strum. Lahainaluna – I Wanna Rest Strum. Singing Bamboo – Latin Strum (omitted for lack of time). From the Hapa Haole Songs Category – Hasegawa General Store, Maui Girl, Medley: Maui Boy/Maui Girl, and Singing Bamboo. From the Pop Songs Category – Lahaina. See all categories of songs with over 100+ audio recordings that you can sing and play along with professional entertainers on voice, ukulele, and ukulele-bass. Stay tuned for the next Sing-Along with Mele Fong Series – Paniolo (Hawaiian cowboy) songs on Thursday, February 21. Thirty-seven people signed up for the 6th annual Ukulele Mele Christmas party that included a sing-along of 14 Christmas songs at Kaunoa Senior Center for adults 55 and better. “You have more people signed up than there is room to fit everyone comfortably.” What a problem to have! 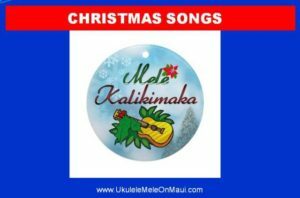 Thirty seven people signed up for the 6th Annual Ukulele Mele Christmas Party on Wednesday, December 19 from 9:00 a.m. – 12 noon. at Kaunoa Senior Center for adults 55 and better. We were in room 101-102 with limited capacity instead of the usual multi-purpose room that is much larger. The party is open to anyone regardless if they are my current students or not. One student (Gail) found a friend (Maricruz) whom she had not seen for 30 years! It’s a small world when making music brings people together. This year we omitted the ornament exchange game and the “guess how many pieces in the candy jar” game – and both activities weren’t missed. Do you live away from Maui and want to learn Christmas songs? ‘Ukulele players can purchase downloadable Single Song Lessons to learn to play some of the songs we did. Each lesson includes the song sheet with unique strum, video lesson on how to play it, audio recording to play along, and video story behind the song. View our classes photo galleries and visit our Senior Classes webpage. The Hawaiian Serenaders presented Hawaiian Style Christmas with hula dancers from Na Kupuna o Kaunoa on Maui. THE HAWAIIAN SERENADERS presented Hawaiian Style Christmas at 11 a.m. on Thursday, December 20 at Kaahumanu Church in Wailuku, Maui. This was our second performance this year at the Picnic for Poki Hawaiian music concert series. The morning before the show, the organizer informed me the show was moved inside the church instead of outside due to inclement weather. It was magical to be singing “Silent Night” as the rain gently fell outdoors as we were cozy and dry indoors. Hula dancers from Na Kupuna o Kaunoa (where I teach classes for adults 55 and better) joined us once again and performed six hulas (see song list below). New this time was the addition of a male dancer, Michael Rhodes, who performed half of the songs with the ladies. I first saw Michael dance O Holy Night as part of his yoga class he teaches at Kaunoa that I attended for the first time the Friday before our Christmas show – and I was so touched that we added the song into the set at the last minute. “Had a good time,” said one of the female dancers after the show. Our show lasted 45-minutes including the song Kupa Landing that we did from memory as an encore. New this time, two videographers from Paradise TV (Visitor Channel) came to shoot footage for their upcoming segment on Wailuku to include Kaahumanu Church. The film makers said they may not stay for our entire concert, but they did. We shall see if any footage shows up on TV. After the show, it was so rewarding to hear positive comments from the audience. Visit our Hawaiian Serenaders webpage to learn more about the professional entertainment side of Ukulele Mele On Maui. ‘Ukulele players can download some of the Christmas songs and learn how to play them via single song purchases. 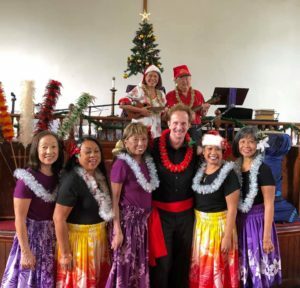 The Hawaiian Serenaders – the husband and wife duo of Richard Tom and Mele Fong – present Hawaiian Style Christmas on December 20 at 11 a.m. as part of the Picnic for Poki Hawaiian music series concert series at Kaahumanu Church in Wailuku, Maui. 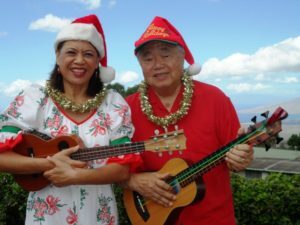 The Hawaiian Serenaders – the husband and wife duo of Richard Tom and Mele Fong – present Hawaiian Style Christmas on December 20 at 11 a.m. as part of the Picnic for Poki Hawaiian music concert series on the grounds of Ka’ahumanu Church in Wailuku. The duo sings and plays ‘ukulele and ‘ukulele-bass to a variety of Hawaiian, hapa haole, pop, and jazz standards. The Serenaders are artists with the University of Hawai’i Statewide Cultural Extension Program, and they have represented the state of Hawai’i in concert at the John F. Kennedy Center for the Performing Arts in Washington, D.C. Hula dancers from Na Kupuna o Kaunoa will be participating in the program. The Hawaiian Serenaders are the professional entertainment arm of Ukulele Mele On Maui, an education and entertainment business since 2011 on Maui. 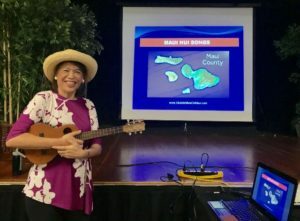 Ukulele Mele, aka Mele Fong, has been teaching ‘ukulele classes since 2009 at Kaunoa Senior Center for adults 55 and better, and continues to offer online lessons and downloadable single song lessons for ‘ukulele players from her website. Mele offers a unique method for forming ‘ukulele chord shapes with minimal muscle strain and strumming styles to fun, sing-along songs taught by no one else. You can apply this method to your favorite song so they sound better and you’ll have more fun. Adults can learn about online lessons by monthly subscription for beginner, intermediate, and advanced ‘ukulele players at https://ukulelemeleonmaui.com/learnwithmele/learn-online/monthlylessons. Adults can learn about downloadable single song lessons at https://ukulelemeleonmaui.com/shopping-cart/single-songs. Adults can learn more about learning to play the Ukulele Mele Way at https://ukulelemeleonmaui.com/learnwithmele. 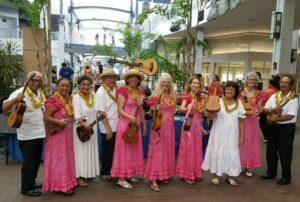 Maui Ukulele Pops Band performed on November 10 at the 11th Annual Maui Ukulele Guild Exhibition at Queen Kaahumanu Center in Kahului, Maui. No other group played our variety of popular songs with different strums. My husband and I led the performance of eight Maui Ukulele Pops Band members on stage this year at the 11th Annual Maui Ukulele Guild Exhibition on Saturday, November 10, 2018 at Queen Ka’ahumanu Center in Kahului. No other group played our variety of popular songs (Filipino, Hawaiian, Japanese, Hispanic, rock and roll, hapa haole) with different ukulele strums. We played the same set as last year which meant no stress as the songs were familiar (we only had one rehearsal before show time). We also wore the same gold garland leis as last year which added a sparkle to our Band formal white or pink attire. After our performance it was rewarding to see people waiting to talk to me to express their appreciation for our music. “Tourists like hearing songs they are familiar with,” commented MC Kathy Collins. The Maui Ukulele Pops Band is comprised of students from my Advanced Ukulele class at Kaunoa Senior Center for adults 55 and better. Most students have been with me since I started teaching at Kaunoa in January 2009. This year’s Band members who performed were: Andrea, Beverly, Charles, Eileen, Janet, Linda, Maricruz, and Sandy who sat in one row on stage. New this year, I decided not to have a Ukulele Mele On Maui display booth and the Maui Ukulele Jazz Trio did not perform a set. This meant we showed up in time to perform just one show from 1:20 -1:50 p.m. and left afterwards instead of staying for the entire event from 9:30 a.m. – 3:30 p.m. to talk to people and perform again. No other ukulele teacher performs twice. This year was also the first time Queen Ka’ahumanu Center coordinated the event with Maui Ukulele Guild and marketed the event in the newspaper. We are committed to performing again as the Maui Ukulele Pops Band next year in the same time slot on the second Saturday of November. You can hear my husband and I perform as our professional duo, The Hawaiian Serenaders, at our Hawaiian style Christmas concert coming up Thursday, December 20 in Wailuku. It’s free and our gift of music to the community.